One of the best ways to prepare your home to accommodate someone with visual impairment is to improve your organization. By having a place for everything and remaining consistent with your organization, you will make it easier for your loved one with low or no vision to know where things are so he can be confident and independent while spending time in your home. Sometimes, just taking the guesswork out of where items are stored helps people with visual impairment immensely. Everything from toiletries to cereals should be kept in the same place each time you stock up so that finding them becomes routine. When you add new items to your home, label them until your loved one becomes accustomed to locating them. You may label items with braille labels, labels with large, contrasting print, or pens that create raised print or dots on items for easy identification. One of the first things you should do when organizing your home to accommodate someone with visual impairment is to reduce the amount of clutter in drawers, cabinets, closets, and anywhere else that you have too much stuff. Decluttering will force you to get rid of expired items and those that are broken or rarely used, and you'll be able to see whether you have duplicate items that you can donate. By reducing clutter, you will make it easier to make room for necessities and organize them for identification and location. Once you have reduced the clutter in your home, you will be able to label the items that remain. An alternative to time-consuming adhesive labels is rubber bands: create an identification system for items that are the same size and shape and use different numbers of rubber bands to distinguish between them. You may put one rubber band on cans of corn and two rubber bands on cans of peas. When arranging rooms and placing furniture, make sure to allow for a natural traffic flow. You may want to keep large pieces of furniture such as couches and recliners against walls so that the visually-impaired person can walk around them. Try grouping chairs and tables to promote conversation. Place table lamps near areas where people sit most often, and place floor lamps behind and off to the side of chairs to eliminate tripping or bumping into them. Carefully push electrical cords for lamps to the sides of the room or tape them down if they cross the path of traffic. To make getting dressed for the day an easier task, put matching clothes together in the closet or hang outfits together when you put them away. Some people opt to put their clothes away by color so they know where to go for their red shirts and blue jeans because items are grouped accordingly. Putting socks in a drawer by color also is helpful. The key is to figure out which type of clothes organization works best for your loved one and consistently stick to it. 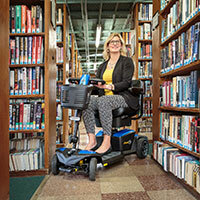 People with visual impairment want to be able to work efficiently at home. Organizing the home office in a functional manner will make that possible. Keep in mind that you want to make equipment, accessories, and files easy to access. Purchase multi-colored folders and label them with large print or Braille. 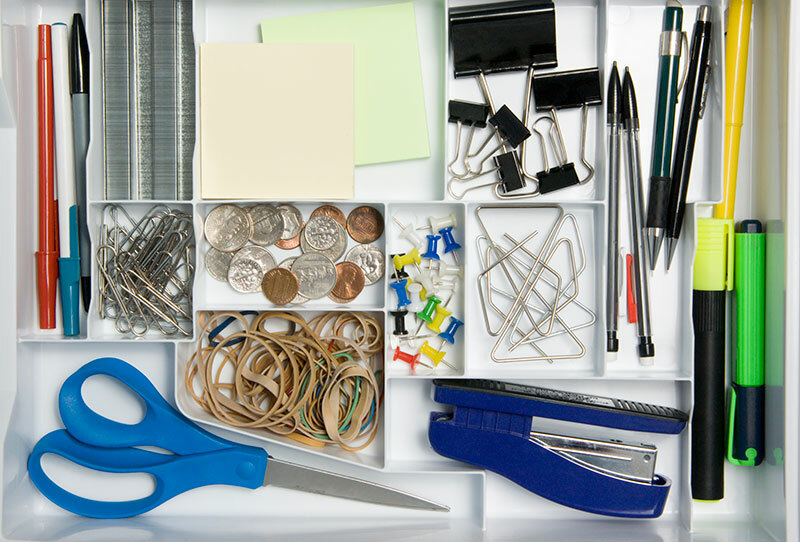 Consider using open-drawer filing systems instead of filing cabinets that have closed drawers. Make sure the desk promotes workflow. If your loved one has a closed circuit television (CCTV) or video magnifier, make sure that it sits off to the side with the computer directly in front of the person and the printer to the left. With this desk layout, the computer can be accessed first because it is the equipment used most often and then printed materials can be used in the CCTV as needed. Knowing where everything is located and being able to access items quickly makes life much easier for people with low or no vision. Because organization is key to people with visual impairments, you should store items in the same place, reduce clutter, arrange furniture for traffic flow, keep matching clothes together, and make the home office as functional as possible. Paul Denikin is passionate about sharing his experiences working on DIY projects to benefit people with special needs.